A year ago, Castroneves won the pole, the pit stop contest and the race. 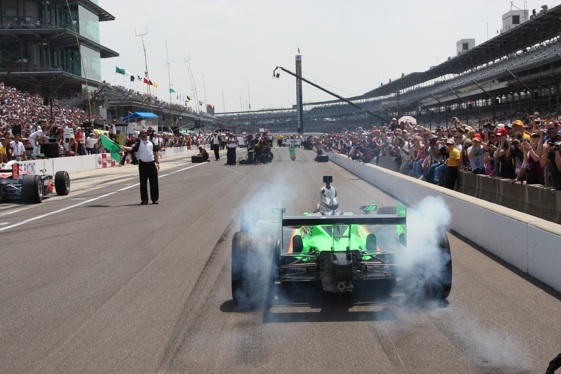 On Friday, he added the 2010 pit stop championship to his pole victory last Saturday. All that’s left is to join A.J. Foyt, Al Unser and Rick Mears as a four-time Indy champion. Just for the record, the latest pit stop victory was a record 11th for Team Penske, which also owns a record 15 Indy 500 wins. Tim Cindric, president of Penske Racing, said the winning races, pit stop competitions or anything else is all about execution. Close Call: Former Indy 500 winner Dario Franchitti, who will start from the outside of the front row in Sunday’s race, was fastest in the one-hour “Carb Day’’ practice on Friday with a lap of 225.574 mph. But the Scot was still talking about a near disaster minutes after the final practice ended. Castroneves, who was fifth fastest at 224.753, said there was a mixup by his spotters and he didn’t know Franchitti was near him until he saw a flash of red in his mirror. “I didn’t know who it was, but I knew it was close,’’ Castroneves said. Scott Dixon, another former winner and Franchitti’s Target Chip Ganassi Racing teammate, was second on the speed chart Friday at 225.159, followed by Castroneves’ Team Penske teammate Will Power at 224.993 and former pole winner Bruno Junqueira, driving for the new FAZZT Race Team, at 224.898. The Brazilian will start 25th on Sunday. Thirty-two of the 33 starters surpassed 220 mph. The only driver who didn’t was Graham Rahal, whose best of 44 laps was 219.998. Rahal, driving for father Bobby Rahal’s team, was seventh in qualifying, but the team tried a change in the downforce on Friday and it left everyone on the Rahal Letterman Racing team scratching their heads. Driven Man: Chip Ganassi, who began his career at Indy as the fastest rookie qualifier in 1982 and has gone on to be a three-time winner of the 500 as a team owner, was presented with the Louis Meyer Award on Thursday night for contributions to the sport and to the Indianapolis 500. Big Boost: The Honda overtake assist system, otherwise known as “push to pass,’’ will be used in the Indy 500 for the first time on Sunday. The system, introduced last August at Kentucky Speedway, provides an extra 5 to 20 horsepower boost for a prescribed time limit on all racetracks by pushing a button on the steering wheel. It can be used to complete a pass or keep someone from getting past you. For the 500-mile race, Honda Performance Development has set a duration of 18 seconds for each of the allowed 15 uses of the push to pass. There is a 10-second reset time between uses.